TWO-TIME Liqui-Moly Bathurst 12 Hour Class B winning team Grove Racing has confirmed two international stars for their Liqui-Moly Bathurst 12 Hour campaign this year. FIA World Endurance Championship and Porsche Supercup ace Ben Barker – a former Porsche Carrera Cup Australia front runner – and Swiss ace Alexandre Imperatori, who raced for Rebellion Racing in the World Endurance Championship LMP1 class last year, will join former Carrera Cup Challenge class winner Stephen Grove. 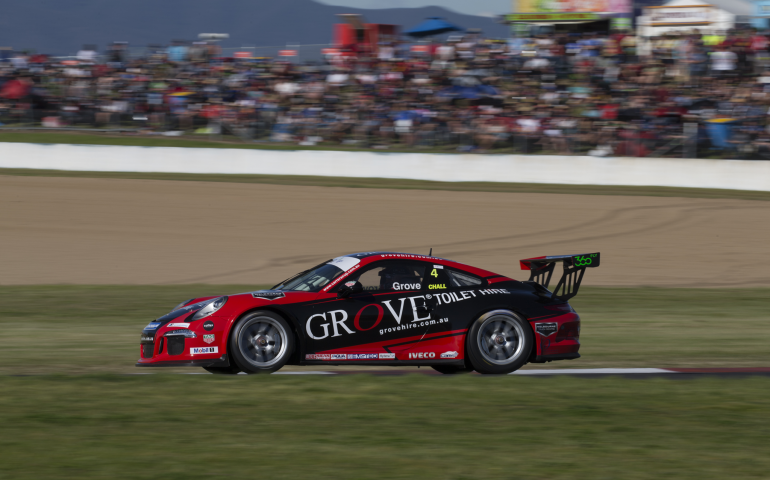 The trio will race Grove’s current Type 991 Porsche GT3 Cup Car, the current-spec Carrera Cup machinery now eligible for Bathurst 12 Hour competition, for the first time, and will seek a third myplates.com.au Class B win. “The first and most important thing is to finish the race. Our expectations are that we need to finish the race and if we do a good job we’ll be in a good position to be on the podium,” Grove explained. “It’s a really good mix of drivers: we went for guys who had lots of experience in a Porsche. Ben and Alex are very experienced Porsche drivers overseas and it was important to get some guys with that experience. Grove said the focus was on getting to the end of the race, rather than focusing on past results. Barker is no stranger to the Mountain and is keen to return with a team he knows well. “I can’t wait to be reunited with the mountain. Last time I was there was with Grove Racing and we almost had another win.. so there is only one position in mind!” he said. “Bathurst is one of the most unique tracks in the world, providing intense gradient and the need for no mistakes so when you complete a quick lap it is as satisfying as you can get. Imperatori said that the Bathurst 12 Hour was on the top of his list of ‘must do’ races on the global sports car and GT schedule. “I am absolutely stoked going to Bathurst for the 12H race,” he said. “It’s a race that has been on my list for a very long time and I can’t wait to get there. Even though I have done a fair bit of endurance racing, Bathurst is a monument of its own and I’m looking forward to the challenge of this amazing track and event. “I first had the opportunity to meet Grove Racing last year during the Porsche Carrera Cup Asia visit to Australia and I could see first hand how professional the team is and that its operations matched its reputation. I also saw Stephen in action and was impressed with his performance in a 991 Cup car: I’m delighted to be able to share a car with him next month. Like so many internationals, Imperatori said that the lure of the circuit itself was generating his pre-race excitement.